On April 9, in the evening, Schérer realized that the whole line of the Republican outposts between Bormio and Lakes Idro and Garda had been attacked by the Austrians and that the French forces withdrew in disorder towards Brescia. This unforeseen news and without no exact knowledge of the size of the enemy force that was trying to encircle his left flank, he immediately ordered the Army of Italy to retreat behind the River Oglio. This allowed his troops to reach the bridges on the Adda, with forced marches, in good order and safety. He strengthened the garrison of Mantua leaving there 6600 men and reorganized the army, disbanding two of the six divisions, raising three new divisions of ten infantry battalions and three cavalry regiments, with an additional avant-guard division of five battalions and two cavalry regiments. The army behind the Oglio numbered around 28000 men and 60 guns. On April 10, he received the news that Dessolle had been repulsed from Glurns and that he was marching back to Bormio in Valtelline. On April 11, Austrian brigade Vukassovich took the Rocca d’Anfo Fortress, which stood guard over Lake Idro (Brescia), then advanced to Fusine and Lavignano near Brescia. His Avant-Garde, led by Colonel Prodanovich, occupied Goito, Roverbella and Marmirolo. On April 12 Vukassovich took Castel Belforte, Bigarella and the right bank of the Molinella channel. General Elsnitz cautiously advanced to the Mantua’s plains with 11 battalions and 8 squadrons. General Sommariva was ordered to besiege Peschiera and put 3 battalions at Monzambano, with outposts on Lake Garda until Goito, and deploy 1 battalion and 2 squadrons as the garrison in Castelnuovo and Cavalcaselle. Colonel Schröckinger was sent from Mozambano to Ponti to blockade the fortress at Peschiera on the Mincio’s right bank. In the meantime, the Austrians moved forward their vanguards to attack the French lines of communications. Before the cities of Brescia and Bergamo there were two vital military structures which had the task to ensure supplies to the Mincio line: Fortress Orzinuovi (see also the Sieges part) and the large Monte Chiaro Depot camp (today Montichiari near Brescia). Orzinuovi resisted until April 30, when it was occupied by a detachment under General Alcaini; Monte Chiaro, however, was cleared by Vukassovich’s troops. 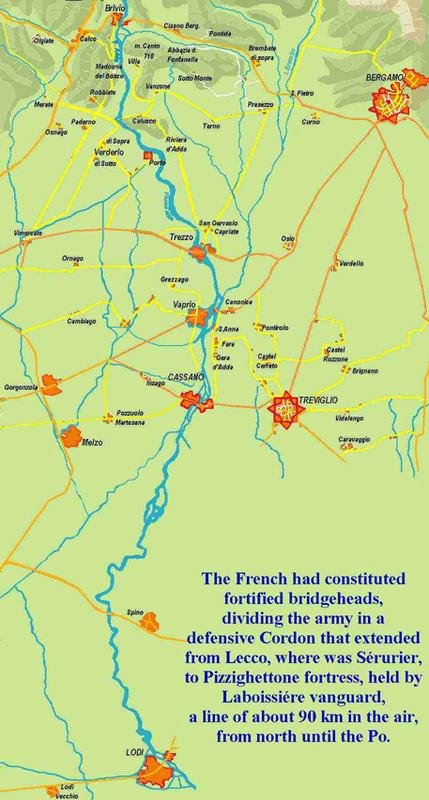 These events forced the French to forget the hypothetical river Oglio line and to move quickly to the more defensible Adda line; this, however, had a major problem: it was too long for only 30,000 demoralized French. If the river Po was the principal line of defence southwards, the only way to protect the capital city of Milano ( Milan) was to deploy along the Adda River, coming north directly from Lake Como at Lecco, and ending in the Po. This Po Line or the so-called Pizzighettone-Cremona-Piacenza triangle, was with Alessandria to the left and Mantua to the right. This would had provided effective defence and would had enabled the army either to wait in safety for the arrival of distant allies or, eventually, to advance offensively in the plains between the Sesia and the Adige Rivers. However, in this case, Milano had to be lost. The Cordon defensive system was too vulnerable, because it allowed the enemy a wide advancing initiative with the possibility to concentrate the forces where wanted. While concentrating troops near the bridges seemed an adequate tactic for that times (streams were very difficult to ford), this deployment left too many gaps to be considered safe. Moreover the defender had to foresee, where the enemy main attack would come. Considering that this strategic defensive disposition had cost the Austrians many defeats by Bonaparte previously, and would cost others in the future), Schérer did not learn from the historical experience. The weather had been severe, and on April 24, the Coalition’s army crossed the Oglio without finding any French; their right moving on Bergamo, their left on Trivuglio (or Treviglio). Hohenzollern Gruppe entered Cremona on the following day, after poor resistance. Almost simultaneously Bergamo opened its gates, after a sharp engagement. The Allies approached the Adda River in three columns towards Lecco, Vaprio and Cassano. On April 25 the headquarters were put at Treviglio while Kray was recalled back to direct the sieges of the French fortresses. Marching from Palazzolo to Bergamo, Sérurier had to invert his march to engage the Russian avantgarde. In the attack Prince Bagration lost 500 men. It was the first official time in which French infantry fought against the Cossacks. The Sérurier “grognards” deployed in a large square, repulsed the Cossacks charge of Grekov riders, who were countercharged on the flanks by the French (and Piedmontese) light cavalry. After the combat the French 1st division du Tyrol continued its march and the city of Bergamo surrendered.